1" Melamine Acoustical Foam, Bonded to 1/8" – 1lb/sq.ft. Mass Loaded Vinyl Barrier with 1/4" Melamine Foam Vibration Decoupler. Convulated or Flat Surface Pattern – SONEX™ Pattern also available. Ideally suited to line equipment enclosures. Commonly used to line walls and ceilings of utility or mechanical rooms to absorb and contain the noise source. Use where sound absorption, noise reduction or vibration control are needed. 2' x 4' (11.33 lbs per panel); Special sizes available upon request. 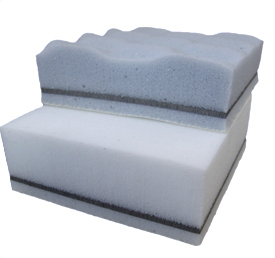 ASTM E84, Class A – Hypalon Coated Foam. Flame Spread: 25. Smoke Development: 185. ASI S.T.O.P. Noise Acoustical Adhesive. Use mechanical fasteners for overhead applications.